Dating back to the 1800s, American Sign Language (ASL) has been the main communication system for Deaf communities in the USA. 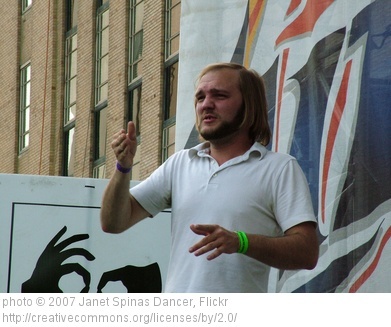 Historically connected with French Sign Language, ASL is used by hundreds of thousands of Americans. But although it is not universal, it is also present in different parts of the world : in addition to the US and Canada, ASL is used in some South American countries, a major part of Africa and a few Asian countries. As in every other language, ASL users sometimes need interpreters when communicating with spoken language users, which is why Accent on Languages (AoL) has been offering ASL interpreting services for many years and has developed a solid relationship with the Deaf community. The Registry of Interpreters for the Deaf, or RID, is the professional organization which certifies ASL interpreters and transliterators. RID’s certification system and Code of Professional Conduct (CPC) ensure that certified ASL interpreters have and maintain skills and adhere to professional ethics. Certified interpreters are required to earn continuing educations units as part of RID’s “Certification Maintenance Program” to continually maintain and improve their skills. Additionally, customers can file grievances with RID if there are any breaches of the Code of Professional Conduct. Because we want to give the best service possible to the Deaf community, Accent on Languages provides RID-certified interpreters and transliterators and supports RID and interpreters for the Deaf by being an RID member. Based in the San Francisco Bay Area, Accent on Languages regularly collaborates with the Department of Rehabilitation, a California state department that promotes equality, employment, and independent living for everyone through services and advocacy. AoL stays involved in the Deaf community and has recently attended events organized by ASL interpreters. We have developed thorough business practices to give as much information as possible to interpreters in order to guarantee that all put client’s needs are met and to make their experience utmost comfortable. The International Medical Interpreters Association Boot Camps are coming to Portland, OR. You will find the dates, links, rates and descriptions communicated by IMIA web below. Please feel free post this flyer at your hospital or organization! Also coming up in Portland, OR!